Content Marketing has now been taken on board by most companies which invest more and more resources into creating awesome original content. However, less than half of marketers feel these efforts are effective. And this is partly due to the lack of tools to measure the real impact of campaigns. This is why LinkedIn has launched a new feature called Content Marketing Score. The new tool was designed to provide marketers with an analytics resource that gives insight into the impact of your paid and organic content on LinkedIn. 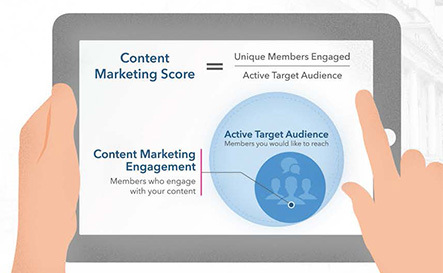 #LinkedIn Content Marketing Score measures the impact of your paid and organic content. And by keeping track on your performance on monthly basis, you will get a clear idea on how well you are engaging with your audience over time. With this knowledge, you will be empowered to upgrade your strategy to optimize engagement within your target. But this does not stop here! Together with the launch of the new scoring tool, LinkedIn also launched a ranking of the topics that are tredning among LinkedIn members. This way marketers will also get an insight into what type of content and subject members are engaging the most. With #LinkedIn Trending Topics, you can understand what content gets the most engagement. These new features are available to customers with a LinkedIn account representative. For more information, click here.